KlapaDooWopella was formed in 1979 in Seattle. The name "KlapaDooWopella" comes from the "klapa" music of the Dalmatian Coast, "DooWop" music from the streets of America, and all sung in "acapella" style. Thus, KlapaDooWopella. While the number of members and personnel have changed over the years, the current quartet still has three of the original members. 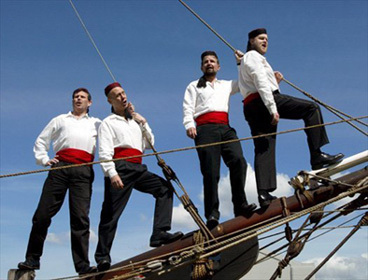 The group was first formed as a "klapa" to sing folks songs of the Adriatic Sea, but has added many styles of singing over the years. We sing klapa music, doo-wop music, folk songs and holiday tunes for special events. We perform actively in the Seattle area and around the world. Performance venues include folk festivals, pubs, street corners and private parties. Contact us to have KlapaDooWopella sing at your next event. The members of the quartet are Justin Ferris (High Tenor), Ted Hunter (Lead), Jim Hoath (Baritone) & Bill Weis (Bass). We hope to sing for you someday -- live or by CD, which you may order from this website. More than 100 miles east of Italy is the Dalmatian coast of Croatia. It is typically Mediterranean, and very mountainous. The crystal-clear Adriatic washes along the hundreds of miles of coastline. The precipitous Dinaric Alps rise thousands of feet, so convoluted and rugged that travel along the coast and its islands is restricted to marine traffic and a two-lane highway that twists and turns. Important coastal cities here include Omis, Split, Rijeka, and Dubrovnik. This coast and its cities have been witness to hundreds of years of strife. During World War II, this and the adjacent Slavic countries were called the "underbelly of Europe." The spark that started World War II occurred inland, and more recently, atrocities have been committed between the various Slavic factions. Even so, the Klapa tradition has been developing for hundreds of years. Originally, groups of men would join together in their villages and sing folk songs based on love, fishing, and the sea. A unique style developed, and it was a mix of local dialect, Slavic sentiment, far eastern sound, and Italian harmonic organization. In good times, and also in bad, on weekends and late into the night, the Klapas would sing. Until the collapse of the communist government, men's voices could be heard harmonizing in the taverns and along the streets. Traditionally, these groups singing in four-part harmony would attract small crowds of hangers-on and listeners. Women occasionally might join in, especially if it was a nationalistic or familiar folk song, but generally the women enjoyed listening in the background. The music exhibits tremendous emotion and feel. All the standard and theoretical elements of music can be heard; complex and free rhythms, folk and Italianate harmonies, dynamics, song and verse. It is joyous and romantic; a way to be released from the cares of the world. Today, it is hard to gather for singing, as it is difficult for Dalmatians to scrape out a living. The economy is heavily dependent on tourism, and they therefore restrict their singing to the non-tourist seasons as this is their only free time for practice. And this is a shame, because people of all ilks love music. Klapa singing perhaps can be reenergized to entertain both tourist and resident alike. In a world far away, imagine, then, hearing voices emanating from a nearby square. As you approach, the strains become louder, but not in volume; instead in intensity. Men are organized in a circle in the center of a plaza; the plaza, in turn, overlooks a reflected moon on the surface of the Adriatic sea. A warm breeze blows through, and on the edges of the stone courtyard, people are seated or standing, quietly listening to lovely, lovely music. We have been to such a place and experienced this warm breeze and the view of the glistening sea while singing Klapa songs. We would like to take you there through listening to our CDs or enjoying a live performance.